John Hurt made an instant impact as the then-unknown War Doctor in the fiftieth anniversary special ‘The Day of the Doctor,’ perfectly exuding the tremendous weariness and strain of a man who has seen so much heartbreak and carnage but who knows that the worst is yet to come. As the incarnation who gave up his chosen name of the Doctor, this figure instantly captured the imaginations of long-term and novice fans alike, and through the audio medium the War Doctor has received another chance to live and develop within the confines and atrocities of the Time War itself. And although the first Big Finish box set Only the Monstrous perhaps played things a little too safely in terms of plotlines and scope given the monumental backdrop, there’s no denying that the groundwork was put in place for a complex, emotional, and ambitious series that Hurt proved more than capable of fearlessly leading. As Infernal Devices opens with ‘The Legion of the Lost’ by John Dorney, Daleks and Time Lords alike bring to bear all weapons that they can find, hoping for the smallest advantage to turn the tide of this unendingly catastrophic war that has claimed so many lives on both sides. As the Daleks experiment with new ways of waging war, Cardinal Ollistra seeks out esoteric armaments of her own, enlisting the help of the man she proclaims to be Gallifrey’s greatest warrior, whether he is willing to help or not. Yet as the destruction of an obscene weapon leads him to a secret Gallifreyan initiative that strikes right at the heart of the fine line between life and death, he must consider if perhaps the cost of victory against the Daleks has become too high. It’s quite telling just how desperate the Time Lords have become that they are seeking out the help of other civilisations, and the Technomancers as a race that blends technology and magic in service of the mysterious Horned Ones who are said to have escaped from their own dimension into this universe in its earliest days are certainly one of the more intriguing races the Doctor has come upon in recent travels, especially given the disdain and irreverence with which they regard the self-important Time Lords. At a time when a weapon such as the Annihilator that can erase something from ever having existing without altering the timelines is possible, the Time Lords have taken to find a way of resurrecting their fallen troops to continue their relentless fight, a prospect the Doctor abhorrently rejects by rightfully claiming that taking away the one certainty of death makes individuals in war nothing more than cannon fodder. Perhaps understandably, the process by which this occurs is laden in quite a bit of technobabble, but even before the Technomancers reveal the Crypt of Non-Time where they can reach into timelines that no longer exist and the truth behind their Horned Ones’ aggression and continued attempts at establishment in this universe, it’s fascinating to note the lines of morality the Time Lords are willing to cross as the Doctor loses further faith in his own people and perhaps acts in his most noble role yet. 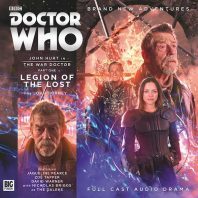 The introductory story of a set is rarely the most memorable, and the fact that a story that is so clearly setting up so much for the future is so polished and enjoyable bodes incredibly well for Infernal Devices as a whole, bolstered here by the added gravitas that Jacqueline Pearce and David Warner bring. John Hurt is immense as always and expertly captures the tortured element of this incarnation as the weight of consequences and then seeing those consequences undone weigh heavily on his conscience, and the Doctor being branded a war criminal is an exciting prospect that Ollistra is sure to take full advantage of going forward. Alhough the time constraints do not allow the story and culture of the Technomancers to be developed as well as might be possible without having to re-etablish the Dalek threat and Doctor’s character given how fascinating they are, the continuing developments of the Daleks and the Time Lords as they descend down parallel paths of moral desolation come to life extremely well and continue to develop the bleak backdrop against which this Doctor must struggle to remain true to himself.